A kinder, gentler side to what is normally considered a white water destination. Not unless camping or beginning your paddle at Blue Water Marina. Mention the name "Richland Creek" to paddling locals around Chattanooga, and they immediately think whitewater. Yet there is a kinder, gentler side to this old creek once it passes the town of Dayton that is perfect for flatwater paddlers, novice or experienced, group or solo. Launch from the public park off Old Washington Highway (Highway 30) and ease your way downstream. 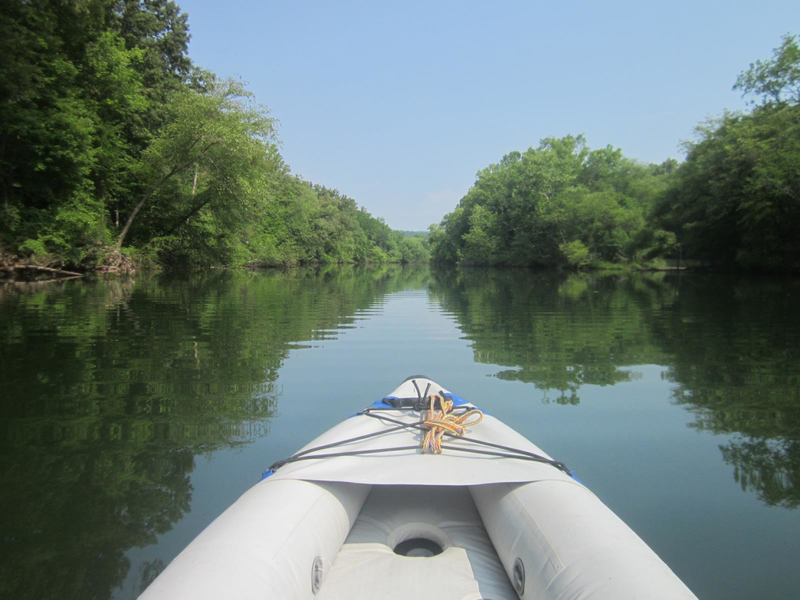 Because it's less than half a mile to the Tennessee River, this boat ramp can be your starting point for paddling to the north end of Hiwassee Island (a Native American landmark and about nine miles round trip back to the marina), or just as far as you'd like. The scenery on the creek and on the Tennessee River is beautiful, forested and covered with rock outcroppings. You're likely to see Great Blue Herons, osprey, Kingfishers, Canadian Geese, varieties of duck, swallows and other birds on the creek and river. You might also see Bald Eagles, Golden Eagles and other raptors. November through February you may see and hear Sandhill Cranes. Bring binoculars! Whether you're going to the river or just to Blue Water Marina and RV Resort (near the end of Richland Creek), the marina is a convenient place to stop for a cold drink and a snack from the well-stocked camp store, use the restroom and enjoy the covered patio overlook of the water. It's also a safe place to duck into if you get caught by a sudden storm. If you want to begin a paddle at the marina without camping, the cost to park is just $5 per vehicle. Anyone with a canoe, kayak or paddle board who enjoys being out in the "real world" on the water. Easy access is one of the best features of this paddle. The entrance to the concrete boat ramp has ample parking for vehicles with or without trailers and it's less than half a mile from Highway 27 in Dayton. Parking is free and checked regularly by Dayton Police.